Working with Pure vowels is a great way to start your singing practice at home. They are useful for every genre – not just classical singers, choral groups or using whilst reciting that lovely yellow book of Italian Aria’s. Pop, MT, Folk and hobby singers can benefit from knowing about them too. A pure vowel is a vowel that doesn’t change as you sing it. ‘Ah’, for example. English contains lots and lots of dipthongs. A dipthong is when 2 or more vowels are smushed together. The letter ‘a’ (pronounced ‘ay’ for purposes of example) contains 2 pure vowel sounds said very quickly in succession: An ‘air’ and an ‘ee’ = ai-ee. When singing, pure vowels usually allow us to sound utterly glorious. With dipthongs, it’s a little trickier. As a rule of thumb, we usually want to prolong the first part of the dipthong to make it sound as pure as possible then add the last part of the vowel sound as late and as quickly as possible, but solo /pop artists like to twist this around to challenge convention / for a different sound / because they may not know anything otherwise / as an individual style. Choral and classical singers have to stick fairly carefully to convention. In the first instance, so that the vowel sounds allow us to blend with the rest of the choir and in the second, to allow us to achieve a lush quality to our singing voice that we can show off. 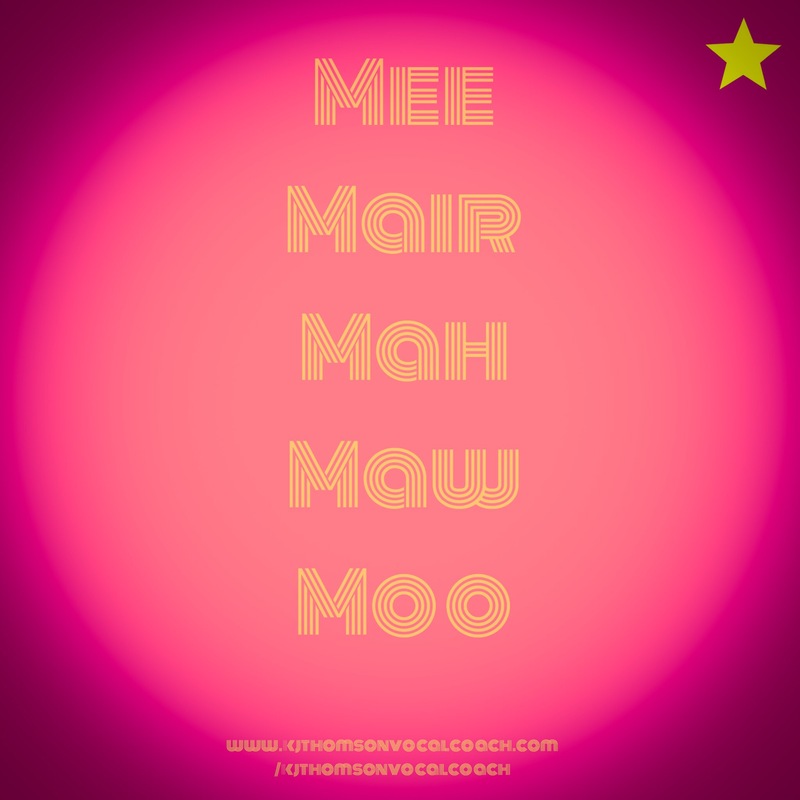 In the meantime, here’s a little reminder of some pure vowel sounds to practice next time you’re singing. I’ve begun each sound with an /m/ so you’re able to hum and pitch your note before opening into the vowel. I hope that it’s useful. Leave me a comment if you have any juicy ways that you use to break convention or let me know if you’re a traditionalist!